Note: The detachable phone stand isn't on the dest mat when you receive it, it's in a small pocket. you can stick it to the mat. We offer 1 year warranty for our desk mouse mat, if there has any questions with our product, welcome to contact us. Premium Material: this mouse pad is made of high-density PVC and soft pad material, provide a silky smooth surface for comfortable operation. Large Size Desktop Mat: 65*32cm. this desk mouse pad provide extended large size for keyboard or books and give you tons of movement space. Multi-function Desk Pad: it not only a desk mat, there have a detachable phone stand and a pocket on the left of the mat. 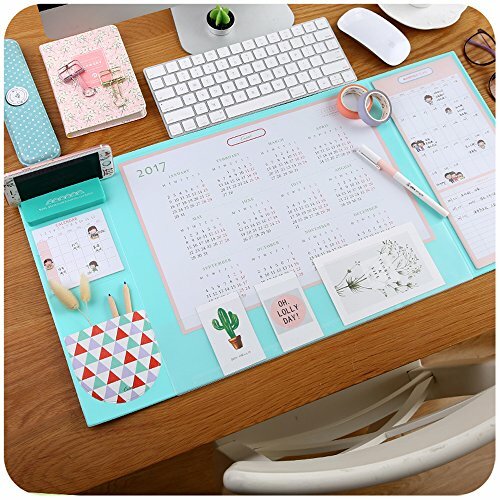 cute monthly schedule cards on the right of mat to write your daily plan and a large 2018/2019 calendar under the transparent pvc scale. Waterproof and Anti-slip Design: surface of the mat is waterproof, prepared for any spills, let your desk more clean. and the bottom of the mat is slip-proof to keep it in place. It will be a perfect helper to keep your Desk clean in your Home, School or Office. Suitable for all ages, especially for Kids, it will be a Perfect Gift for your Children. Note: Manufacturer "Fawziya Tang" offer 1-Year Warranty, so pelase ensure your order was sold by Fawziya Tang to get ALL PARTS and WARRANTY. if our product has any problem, welcome to contac us. View More In Keyboard & Mice Accessories. If you have any questions about this product by Mirstan, contact us by completing and submitting the form below. If you are looking for a specif part number, please include it with your message. Homy Compatible Full Protection Kit for New MacBook Pro 15 inch 2016, 2017, 2018: Keyboard Cover, Touch Bar Protector, Trackpad Protector, Webcam Anti-Spy Cover & Dust Plugs Port Protect Accessories.